I visited DON LEONE last week, for the first time since it relocated from its previous home further up Queens Road, in the building currently occupied by Cultura. It’s been about a year since the move, so it’s taken me a while to get around to checking the place out. The reason for my tardiness is that judging Don Leone purely on glances through the window when walking past, I felt that the decor looked a little white and sterile. From this first impression I thought that it would lack intimacy and individuality – two of my favourite qualities in a restaurant. Also, my long-time Queens Road favourite Barceloneta was just next door, and as a result I’d overlooked its modest Italian neighbour as a potential dinner venue. So, while I was keen to add to my list of Clarendon Park restaurant reviews (Barceloneta, Jones’ Café Bistro and Cultura reviews are elsewhere on the blog), it’s fair to say that I approached my dinner on Friday night without high expectations. Three hours, three courses and a bottle of wine later and I was well and truly converted. 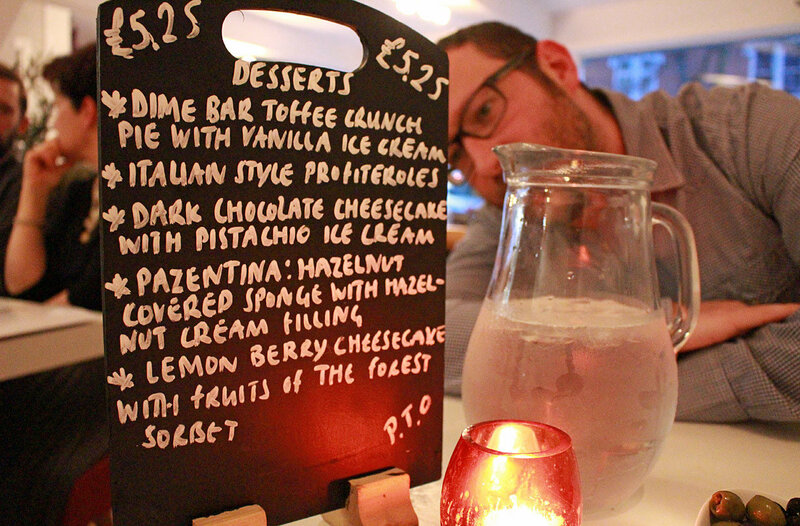 If you like simple, tasty Italian food, speedy service and dangerously boozy desserts read on – there’s a hidden gem right on your doorstep. As soon as you walk through Don Leone’s front door you’re presented with a considerably more cosy environment than its exterior might suggest. A profusion of candles, along with big murals and prints of familiar Italian cityscapes on the walls help to set the scene. We were shown to a table near the back of the restaurant next to the little bar, on the mezzanine level. Although not as good for people-watching as the window seats, this part of the restaurant had a little more colour than the rest, further counteracting the all-white minimalist impression you get of the restaurant from outside. Soon after sitting down we were served a complimentary bowl of big juicy olives and some ciabatta bread. The ciabatta was delicious and its very presence was reassuring – it’s good to see that not every restaurant in the UK has been infiltrated by the current baffling sourdough fad/conspiracy. Don’t get me started on sourdough. The menu at Don Leone is large and varied, without being overwhelming. There is a large selection of both pastas and pizzas as well as traditional Italian meat and fish dishes. With the profusion of ‘safe’ options – classics like margherita pizza, lasagna and salmon fishcakes – I can imagine that Don Leone is popular with less adventurous diners and people with small children. Indeed, its website says that it offers “an extensive range of dishes, with options for children and senior citizens.” There are a few more adventurous options on offer though, particularly for fish and seafood lovers, and the sizeable specials board offers a list of seasonal dishes. For my starter I had Funghi al Dolcelatte – flat garlic mushrooms topped with melted dolcelatte cheese and rocket. Dolcelatte, which literally translates from Italian to ‘sweet milk’ in English is a wonderful cheese – similar to gorgonzola but milder and sweeter, while retaining the creamy texture of its more pungent relative. 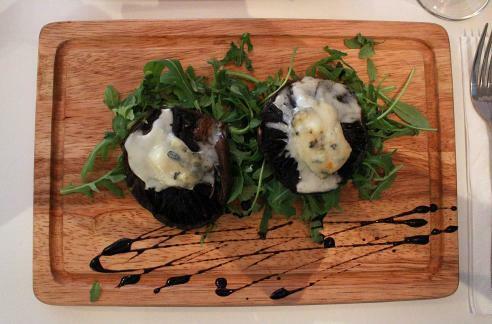 The combination of creamy, melting blue cheese and mushrooms in this starter is an absolute winner, and this dish set the theme for the rest of the meal – fresh, tasty ingredients authentically cooked in classic combinations. Will had bruschetta for his starter – warm ciabatta bread, topped with vine tomatoes and red onions with a drizzle of basil pesto. Another simple classic, there was absolutely nothing not to like about this unpretentious dish, and it showcased the freshness of the ingredients perfectly. The menu also gives the option to add slices of prosciutto ham to this starter for a non-veggie option. The philosophy at the heart of traditional Italian food is of simple, fresh ingredients cooked in an unfussy way that shows off their natural flavours. This is a wisdom that is followed with huge success at Don Leone. At one point Will looked at his plate and said that he could taste every single ingredient that he could see on it – there were no hidden extras and nothing added just for aesthetic reasons. A review which would be taken as a real compliment by any Italian chef! I chose the Salmone alla Pesto for my main course. 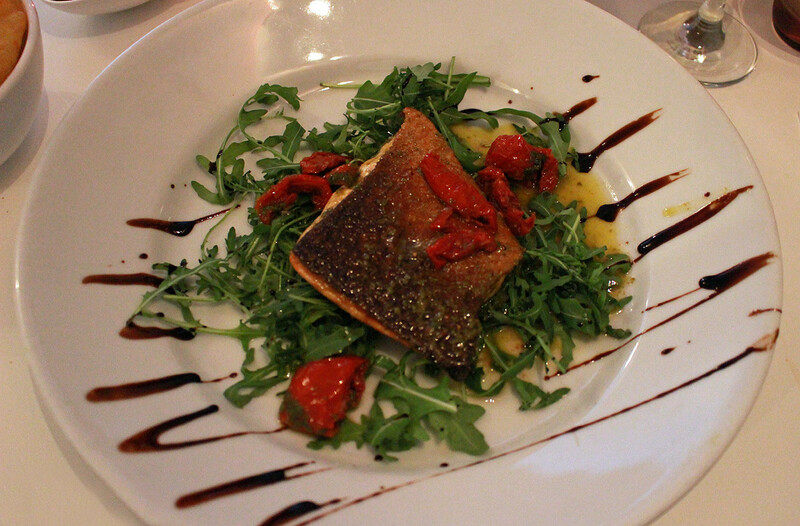 This was a baked salmon fillet on a rocket, pesto and sun blushed tomato salad and it was hugely tasty, with the fish perfectly cooked. Will went for the Tagliatelle Pepe e Zucchini, which consisted of roasted red peppers and courgette ribbons in a white wine and pomodoro sauce with a hint of chilli. Vegetarians who have visited Italy will know that a genuinely veggie dish is a rare thing indeed (a lot of Italian chefs seem to think that prosciutto doesn’t count!) Thankfully, Don Leone have an excellent selection, including this delicious pepper and courgette tagliatelle. We also tucked into a side order of delicious, crispy, chunky chips. You know the kind of chips that are impossible to recreate at home because they rely on some convoluted triple-frying procedure that only chefs know about? Those. The service throughout the evening deserves a special mention. From our arrival and the delivery of each course, to the processing of the bill, everything was timed to absolute perfection. There were plenty of staff on duty, but even so there must have been some exceptional teamwork going on between the front of house staff and those in the kitchen to have got everything running so seamlessly. The wine list at Don Leone is short but offers a good variety of options, with white, red, rose and sparkling wines from Italy and further afield. We chose a full-bodied Sicilian Grillo to accompany our meal and its bold flavours matched the food nicely. The well-stocked bar at the back of the restaurant stocks all the usual spirits and liqueurs, as well as bottled beers and cider. There’s also a substantial soft drink menu and a good selection of coffees and teas. It’s very rare indeed that dessert is my favourite course of an evening meal, but Don Leone has got a stonking pudding up its sleeve. I don’t often have room for a final course and tend to prefer something fairly light so I was hoping that there would be something along the lines of a dolcetti on the menu. 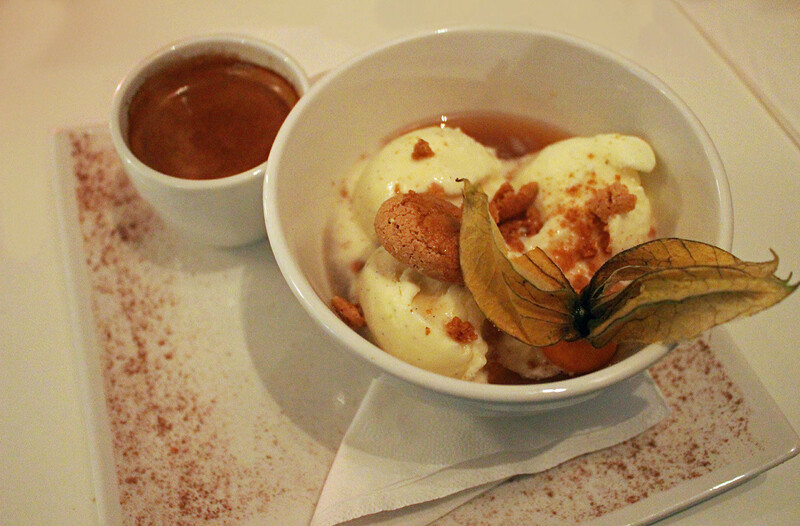 The Café Gelato – vanilla ice cream with crushed amaretto biscuits, amaretto liqueur and a shot of espresso – sounded like it fit the bill. This dish is so obviously simple that it’s perhaps difficult to imagine what could be so great about it. Certainly the flavours of vanilla and almond are tried and tested friends, but there’s more going on than that. The combination of hot espresso (served alongside the dessert by the way, not poured on top) and cold ice cream, accompanied by the mix of smooth and crunchy textures, takes your mouth on a delicious little journey. The destination of this trip soon becomes clear when a generous hit of amaretto welcomes you to Funky Town. As well as the diners in the restaurant, which was a little over half full, a steady stream of guests arrived throughout the course of the evening for an event in the function room upstairs. The fact that there was an event in full swing meant that I was unable to pop my nose in to see what the function room looked like so I’ll update you on that at a later date. From what I’ve heard though it’s a reasonably big and well-appointed space and several dining options are available to suit large groups. Party venues and private function rooms are in short supply in Clarendon Park so this is definitely one to bear in mind, and if the service in the restaurant is anything to go by you’ll be well looked-after. Don Leone is on to a good thing – simple, delicious Italian food served in unfussy surroundings by a fantastic team of staff. The unelaborate, no-nonsense approach to food and decor is comparable in many ways to what you might find in a successful Italian-themed chain restaurant like Ask. The difference is that Don Leone is a small, independent business (there is a sister restaurant of the same name on The Parade in Oadby), run by a local family with Italian heritage. Next time you’re passing Don Leone, why not pop in for a pizza and a pud? It will cost about the same as Pizza Express, but with its authentic Italian roots, local flavour and big and boozy desserts, it’s head and shoulders above anything a soulless chain restaurant can offer. Sounds great. Looking forward to giving it a try.